The gas fire pit is a welcome gathering spot year-round. Spending time outside in a garden offers powerful benefits for your overall well-being. It’s believed to reduce anxiety and stress as well as improve concentration. Taking in the sights and sounds of nature appears to be especially beneficial for boosting creativity. That may explain why the urban sanctuaries we’re showcasing each have one owner whose creative talents are second nature. Both gardens were on tour last year for the benefit of the Pittsburgh Botanic Garden. 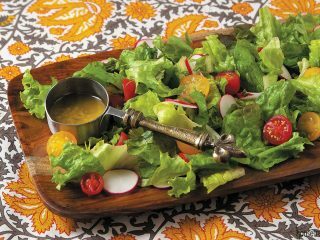 The benefit for tour attendees is the opportunity to glean ideas that help to make a garden a healthy oasis. 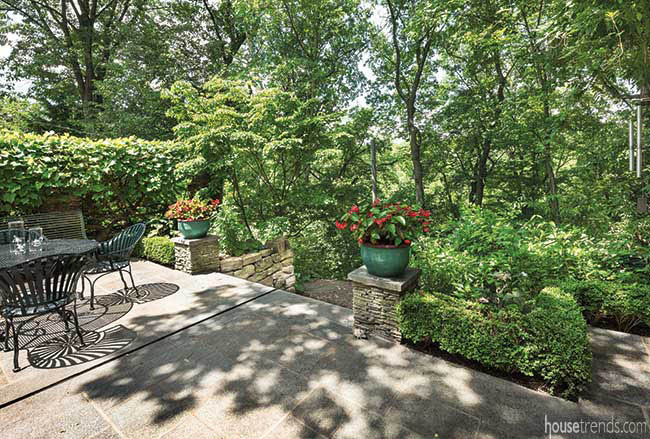 Located in a city neighborhood steps away from a heavily trafficked road, the Drake garden benefits from backing up to one of Pittsburgh’s wooded parks. 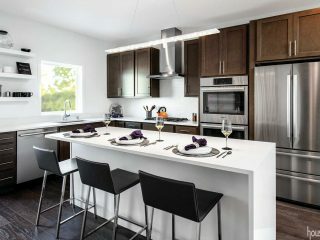 However, the feeling of tranquility envelops one immediately upon entering from the street. 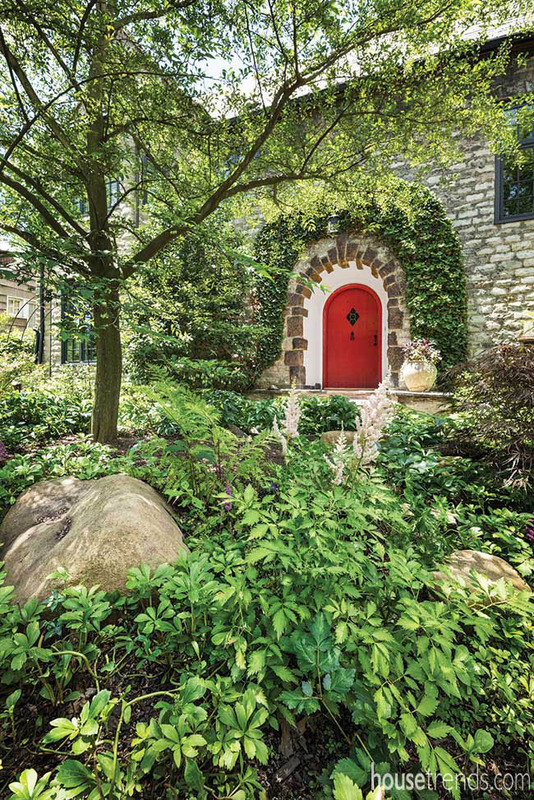 As you climb the stone path through the front garden, which is surrounded by a Pennsylvania sandstone retaining wall, the mature plantings of Japanese maples and a weeping weigela gradually reveal the way to the ivy-adorned arched front door. 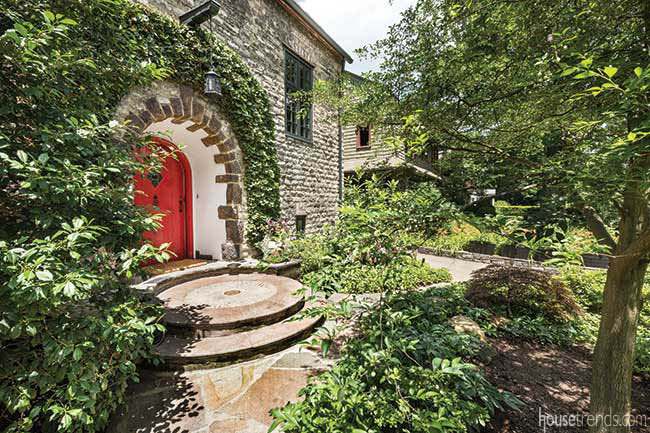 Sarah and John Drake have renovated both the home and the garden over the 20-plus years they have lived in the European-style granite stone home built in 1928. 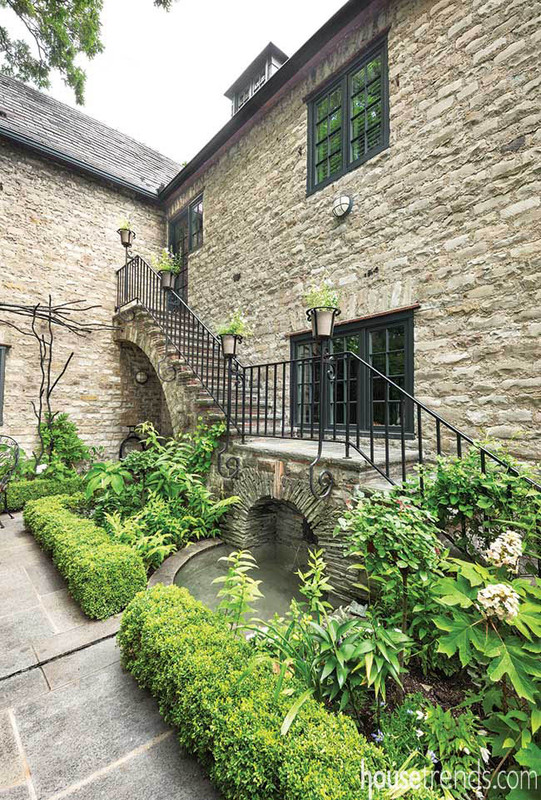 As an architect, Sarah designed and oversaw the renovations that seamlessly blend with the original architecture. One of her creative influences came about during the restoration of the Bacchus Gargoyle fountain that is the centerpiece of the rear courtyard. Previously the water was held within the pool of the fountain and drained through an old terra-cotta pipe. 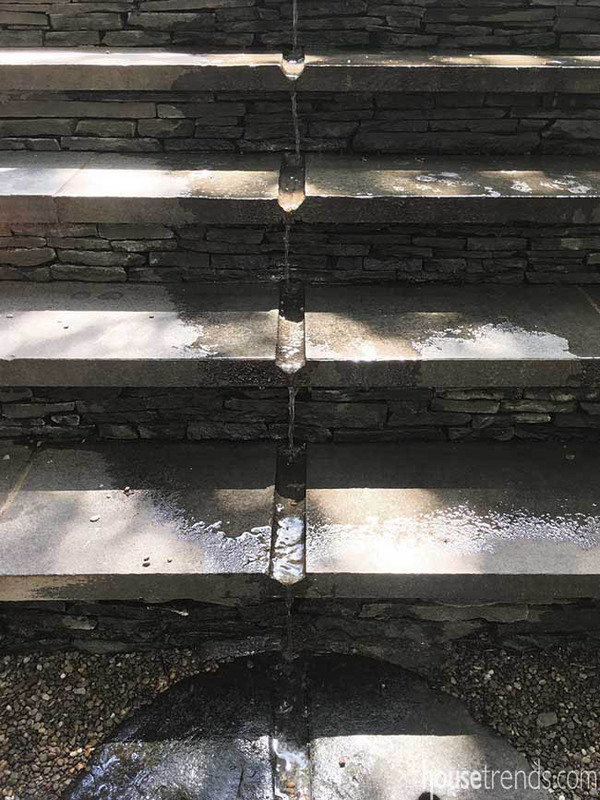 Sarah was inspired to create a water rill – a narrow and shallow channel cut into the bluestone patio pavers through which the water flows. 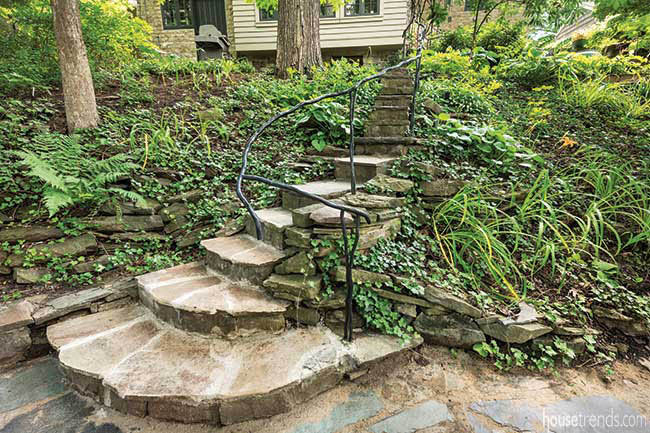 The rill channel visually guides you down the steps to the lower level patio. 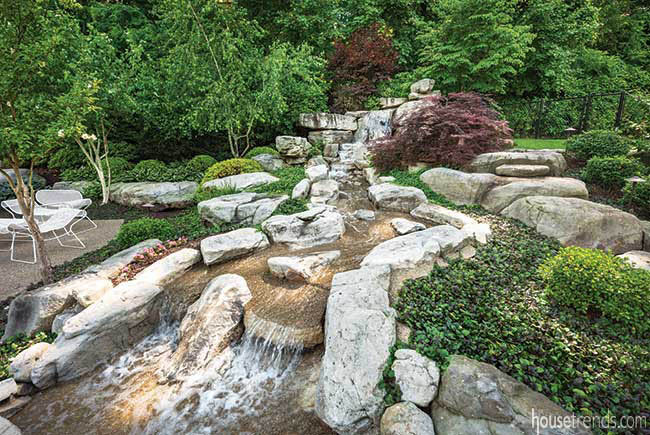 As the water slowly cascades downhill it creates a soothing sound. An old millstone artfully placed at the stairs’ end serves as the splash pad. Over the years the Drake family has enjoyed dining, relaxing and entertaining on the terrace. They can listen to music while spending time outdoors because the sounds of nearby traffic are minimized by both the sound of the water and the buffer of the varied and beautiful plantings. The design takeaway: Trees and shrubs provide both visual and sound barriers. 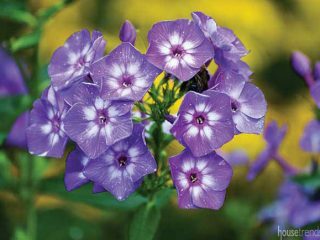 They deflect and absorb sound – another tremendous benefit of plants. Designing a garden with this concept in mind provides a method of escape. Shutting out the chaos and giving yourself privacy within tight living quarters is invaluable to one’s quality of life. 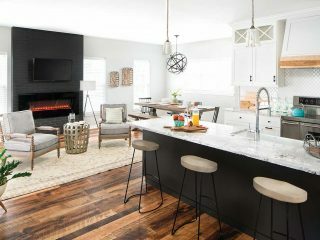 After a storm cleared trees in Steve and Andi Irwin’s back yard and created an open area, the Irwins decided to construct an artist studio, and the transformation of their conventional back yard into an environment for creative inspiration began. 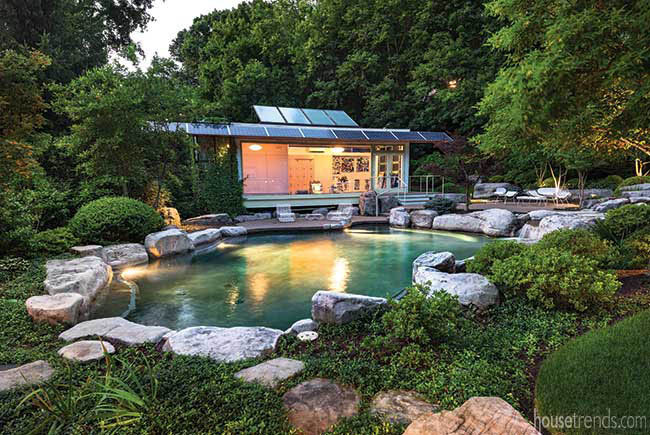 The Irwins collaborated with the studio’s architect, Eric Fisher, and landscape architect Jim Lampl on ways of connecting the studio to the home through the garden. 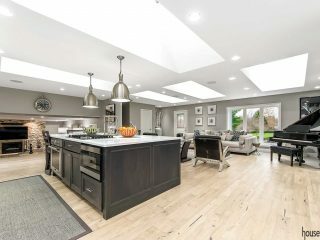 Lampl’s challenge was to make it natural looking and environmentally sustainable – an important touchstone for the Irwins. Boulders skillfully placed by Lampl anchor the planting beds and help to define pathways through the garden. 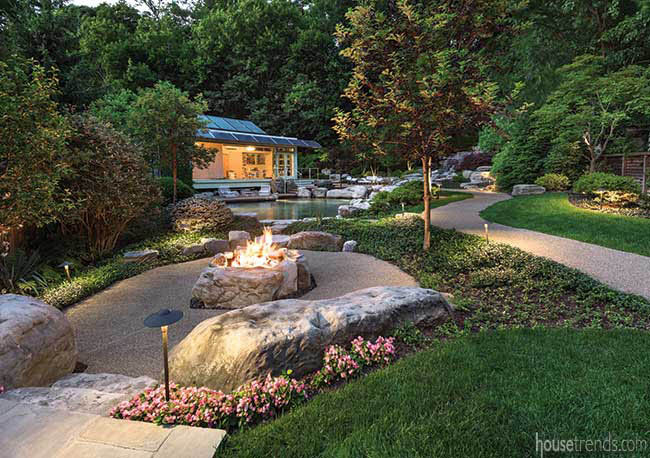 There are many destination spots for gathering and relaxing, including a dramatic boulder fire pit, which is enjoyed year-round. 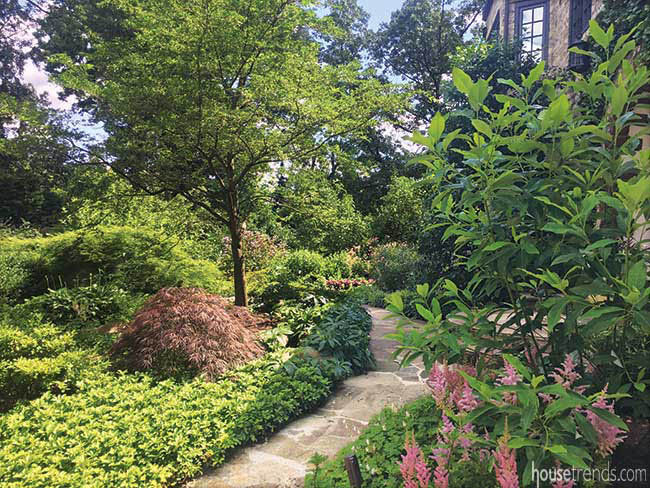 The garden is planted with rhododendron, azaleas, magnolia, Japanese maple, flowering ground cover and many native plantings. 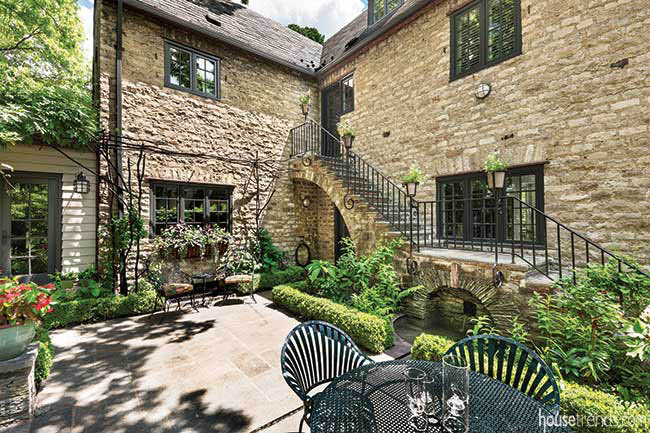 The plant palette adds to the serene ambiance and is generally low maintenance. Wildlife finds a haven in their back yard, and the family is entertained by their visits. 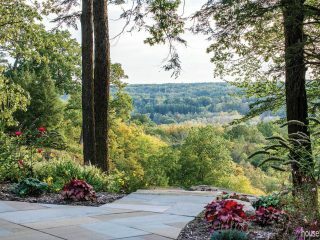 Andi’s personal philosophy is that a beautiful space will inspire you to greater heights, and the garden exemplifies that. 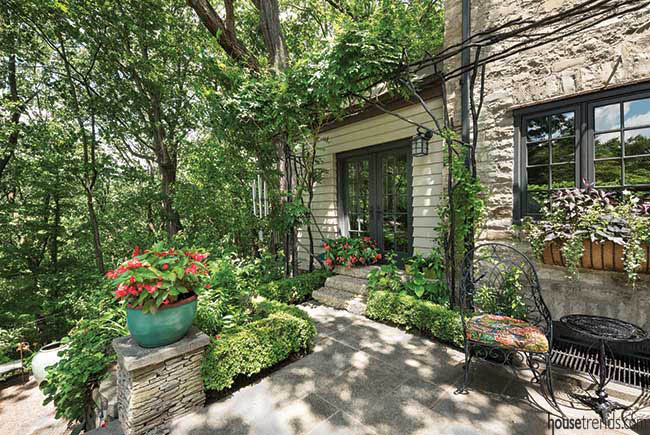 Her artistic talents are energized by the garden that she views from her studio. Moreover, the Irwins express that the garden has positively changed their lives. It’s the centerpiece for family gatherings. It’s the favorite teen hangout of their youngest daughter and her friends. Their extended family is invited to hold graduation and birthday parties there. They wanted to create a space that brought people together, and they have. People are drawn to the garden. They’ve observed that the surroundings put people in a different state of mind. Visitors are moved to make art, play music and express creative thoughts, even romance. One young man visiting from China proposed to his intended in the garden at sunset. 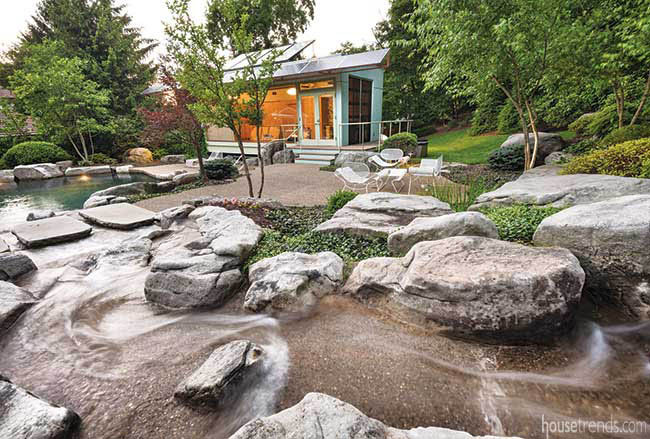 The design takeaway: A well-designed garden is integral to people’s lives. Gardens that attract wildlife to where people are make it truly come alive, and flowing water’s soothing sounds are restorative. 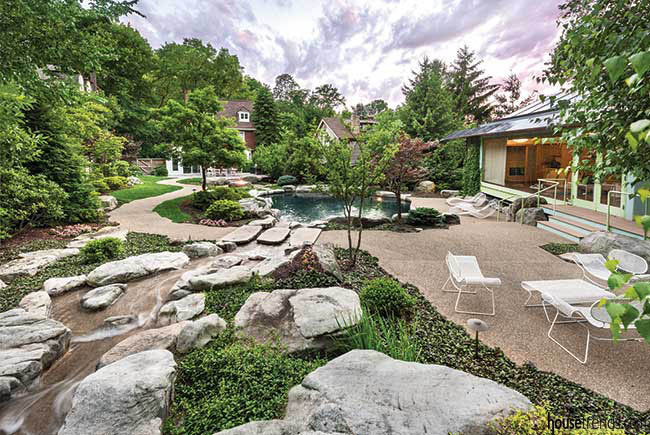 Resources: Architect: Eric Fisher, AIA, Fisher ARCHitecture; Builder and contractor: Will Carpenter, Carpenter Construction, Inc.; Landscape designer: Jim Lampl, Lampl Landscape Service; Outdoor furniture: Henry Hall Designs; Pool: Specialty Pool Contractors, Inc.; Landscaping: Vigliotto Landscape & Construction, Inc.